Sumac Family. Anacardiaceae. Poison Ivy. Rhus Toxicodendron L.
Other Common Names: Poison-oak, Poison-vine, Three-leaved Ivy. This plant is a native of eastern North America and extends west to Alberta. It is notorious for its extremely irritating effect on the skin. It contains a non-volatile oil, toxicodendrol, which, when brought into contact with the skin of a susceptible person, causes inflammation and swelling, accompanied by intense irritation, and followed by vesicles or blisters. The skin breaks and a liquid exudes which, on drying, forms crusts or scabs. Pammel quotes two reports of death from severe Ivy poisoning in the case of children. The action is slow, characteristic symptoms appearing only after a lapse of eighteen hours or more. Some people are not susceptible and can handle the plant without harm. It is believed by many that those on whom the poison is effective may even be poisoned without handling it, from hairs and pollen grains or even from the smoke of its burning. McNair's recent investigations of Rhus diversiloba Torr. and Gray, which is so nearly like Rhus Toxicodendron that many botanists consider the two identical, have led him to the conclusion that this belief is erroneous. He finds that the poison is contained in ducts in the bast or inner bark of the plant and that the wood, pollen, hairs, and the corky layers of the bark are harmless. It is probably the fact that the poison is a nonvolatile oil that has led to so much of the popular confusion with regard to its dissemination. By unwitting trampling among the plants the poison is deposited on boots or clothing, whence it would become a centre of future distribution. The oil has no effect on the skin of the most of the lower animals, and it is stated that almost all domesticated animals can eat it with impunity. Dogs, however, are poisoned by it. Treatment* consists in the removal of the poison from the skin by solution or by decomposing it chemically. Scrubbing with soap and water is recommended and produces good results. It should be done before the poison has had time to sink deeply into the skin. Alcohol will dissolve the oil, and washing with a 50% solution is effective. It is stated that lead acetate neutralizes the irritating substance. A saturated solution of this salt in 50% alcohol has been proved most effective. * In a publication received since going to press, Güssow reports uniformly good results from applications of tincture of iodine, each followed after twenty-four hours by washing with soap and water (Can. Field Nat., vol. XXXV No. 6). 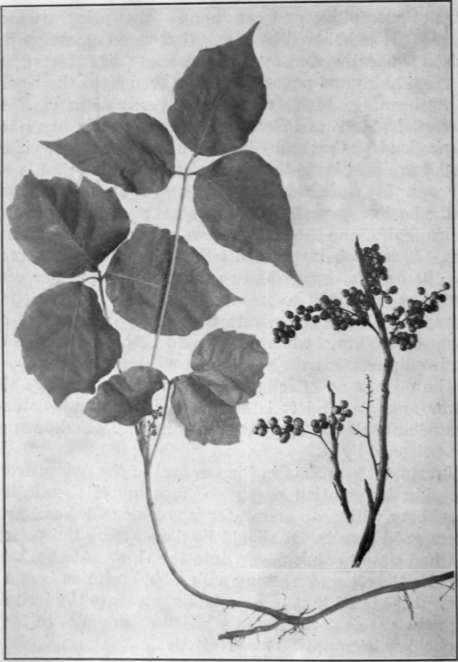 Fig.35 - Poison Ivy - Rhus Toxicodendron. Summer and winter condition. The plant is a perennial shrub, sometimes low and erect and sometimes trailing or climbing by aerial rootlets. The leaves are petioled, and pinnately compound, with three irregularly ovate leaflets, variously notched and toothed. Scarcely two leaves on the same or different plants can be found alike, and this proves a most valuable means for identification. The inconspicuous flowers grow in loose panicles in the axils of the leaves. The fruit is whitish and globular, with a waxy appearance. Whenever practicable, Poison Ivy should be eradicated. Where possible it is best to plow the land where it grows and crop it until the ivy is killed. For places where this cannot be done, Stone recommends a solution of one-half to one pound of arsenate of soda dissolved in five gallons of water. This should be applied in sufficient quantity to soak into the soil and reach the roots. Five gallons is sufficient to treat three to five square rods. The Plant Western Poison Ivy or Poison Oak, Rhus Rydbergi Small, a low shrub growing in the Rocky Mountain region, has the same effect as Rhus Toxicodendron. Unlike the latter, it does not creep or climb, but always stands erect, one to two feet high. The three leaflets are often tinged with purple when young. The small, greenish flowers are borne as in the eastern Poison Ivy, and the shiny white fruit is similar. Poison or Swamp Sumac, Rhus Vernix L., is a shrub or small tree sometimes attaining a height of twenty-five feet. It is found in the eastern and central United States and in Ontario, and produces effects similar to those of Poison Ivy. The leaves are petioled and pinnately compound, with one to thirteen entire leaflets, obovate, oval, or the lowest ovate, with short stalks and acuminate points. The small, green flowers are in loose panicles in the axils of the leaves. The fruit is greyish in colour and slightly oblong. The leaves are very brightly coloured in autumn.